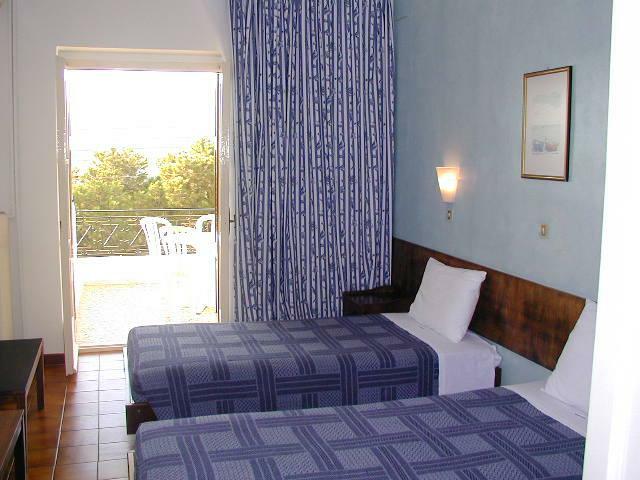 The Oasis Hotel is a small family hotel, fully renovated in 2001, with warm and friendly atmosphere. 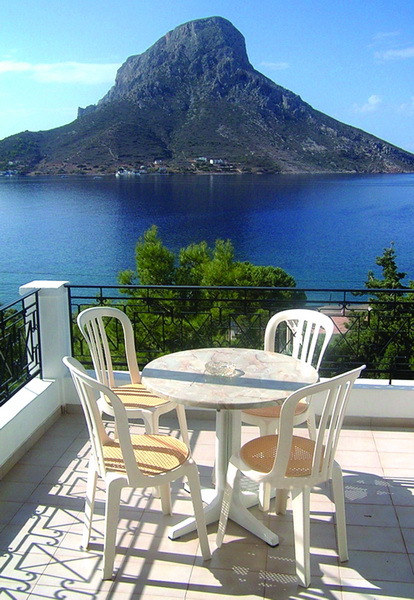 The beautiful terraces with breathtaking views of the sea and the island of Telendos or the mountains, the picturesque garden with stone, make it special. Located in Massouri, just 50 meters from the beach, taxi and bus station and very close to taverns, restaurants and shops. There is easy access from our hotel to the nearby climbing areas, but also to nearby ports, from where one can enjoy beautiful excursions by boat to the island of Telendos, but also to other beaches on the island. It has 19 air-conditioned room with bathroom, satellite TV and mini bar. 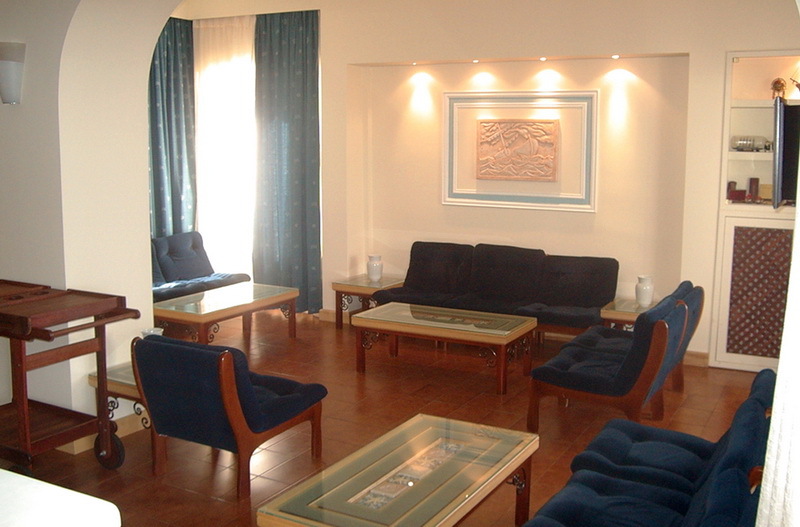 In the living room, there are at your disposal, satellite TV, a library and a shop with jewelry, cosmetics and gifts. There is also wireless internet connection (wi-fi), free for hotel guests. The Oasis coffee bar offers a wide variety of savory and sweet tastes of home. 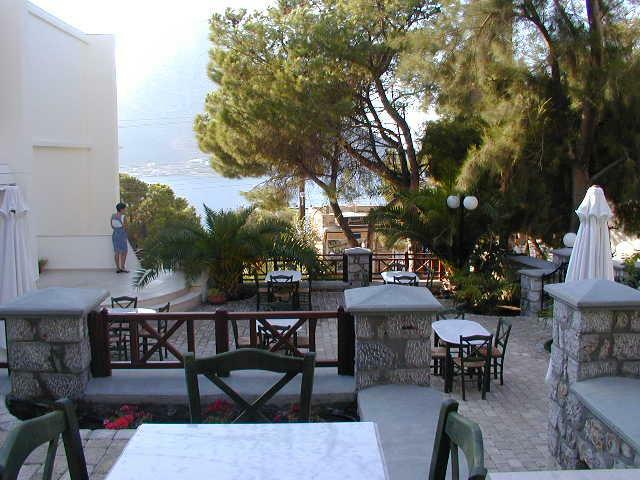 In the summer of 2012, our hotel will open its cooperation with the agency of alternative tourism Alter Holiday DMC for Greece, housed in the premises of Oasis. This new fact will give our customers the opportunity to experience another side of the beautiful island of Kalymnos by participating in excursions, nature activities, culinary festivals, cultural events, excursions to nearby islands, etc. L'Hôtel Oasis est un petit hôtel familial, entièrement rénové en 2001, avec une atmosphère chaleureuse et conviviale. Les belles terrasses avec vue imprenable sur la mer et l'île de Telendos ou les montagnes, le jardin pittoresque avec de la pierre, le rendent spécial. Situé à Massouri, à seulement 50 mètres de plage, de la station des taxis et de bus et très proche de tavernes, restaurants et magasins. On peut accéder facilement à partir de notre hôtel aux zones d'escalade, mais aussi aux petits ports voisins, d'où on peut profiter de belles excursions en bateau vers l'île de Telendos, mais aussi vers d'autres plages de l'île. Il dispose de 19 chambres climatisées avec salle de bain, TV satellite et mini bar. Dans le salon, il y a à votre disposition, télévision satellite, une bibliothèque et un petit magasin de bijoux, de produits de beauté et de cadeaux. Il y a également une connexion Internet sans fil (wi-fi) gratuit pour les clients de l'hôtel. Le café-bar Oasis offre une grande variété de goûts salés et sucrés faits maison. L’ été 2012, notre hôtel inaugurera sa coopération avec l'agence de tourisme alternatif Alter Holiday DMC pour la Grèce, logé dans les locaux de l'Oasis. Ce fait va donner à nos clients la possibilité de découvrir une autre facette de la belle île de Kalymnos en participant à des excursions, des activités de pleine nature, festivals culinaires, manifestations culturelles, des excursions vers les îles voisines, etc. Das Hotel OASIS ist ein kleines, familiengeführtes Hotel, komplett renoviert seit dem Jahre 2001 mit warmer und freundlicher Atmosphäre. 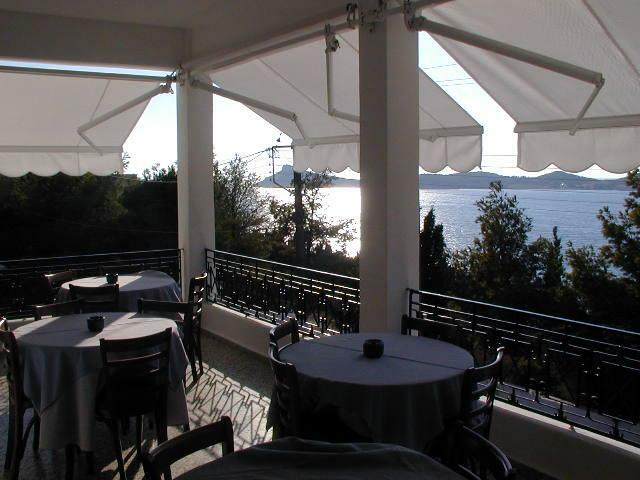 Die schönen Balkone und Terrassen mit einmaliger Aussicht auf das Meer und die Insel Telendos sowie die malerischen Garten machen dieses Hotel einzigartig. Das Hotel befindet sich in Massouri, nur 50 Meter vom Strand entfernt. Verkehrsanbindung (Taxis, Busse) sowie Tavernen, Restaurants und Geschafte sind in unmittelbarer Nähe. Auch die Anbindung an die Κlettergebiete und die nahegelegenen kleinen Häfen, als Ausgangspunkt zur Uberfahrt auf Telendos und andere Strande der Insel ist sehr günstig. Es besitzt 20 vollklimatisierte Zimmer mit Bad,Sat-TV und Minibar. Im Aufenthaltsraum stehen Ihnen Sat-TV, eine Bibliothek und Schmuck-, Kosmetik- und Geschenkegeschaft zur Verfugung. All saints can do miracles, but few of them can keep hotel. Χρησιμοποιήστε την παρακάτω φόρμα επικοινωνίας ή επικοινωνήστε μαζί μας τηλεφωνικός για να ρωτήσετε πληροφορίες, διαθεσιμότητα ή να κάνετε κράτηση. Το ανθρώπινο δυναμικό της εταιρείας απαρτίζεται από μια ισχυρή, ευέλικτη και έμπειρη ομάδα, ικανή να παρέχει ολοκληρωμένες λύσεις προς την ολοένα και πιο απαιτητική αγορά. Οι λύσεις, που η εταιρεία προσφέρει στους πελάτες της επικεντρώνονται στην αξιοποίηση των Τεχνολογιών Πληροφορικής και Επικοινωνιών (ΤΠΕ) ως μέσου επικοινωνίας, συναλλαγών και διαχείρισης σχέσεων οργανισμών και εταιρειών με την αγορά, τους πελάτες, τους προμηθευτές, τους συνεργάτες, καθώς και κάθε ενδιαφερόμενο. Copyright © 2012 Oasis Hotel. All Rights Reserved.